Candyman director Nia DaCosta offers an intriguing hint about the film’s new star. Michael B. Jordan’s next action role is downright biblical. Morbius set pictures hint at a sneaky Spidey in-joke. Plus, new Spider-Man: Far From Home posters, more looks at Stranger Things’ third season, and Idris Elba with a flamethrower. Spoilers get! 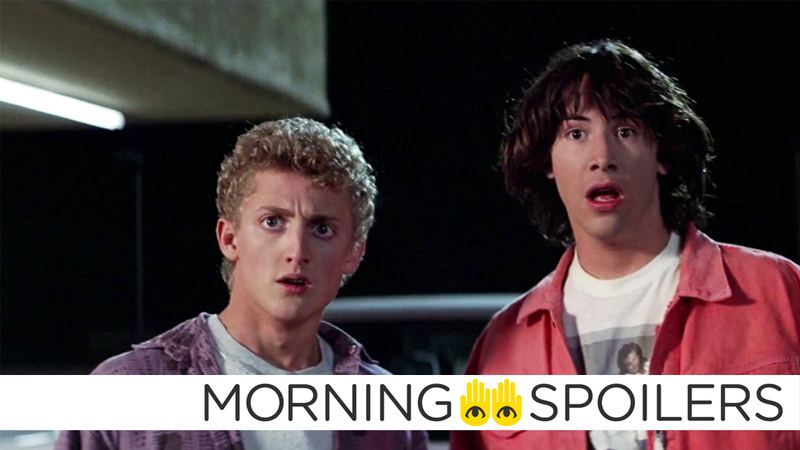 William Sadler (Agents of SHIELD) will reprise his role as Death in Bill & Ted Face the Music, according to the film’s official Twitter. In a recent interview with Collider, “spiritual sequel” director Nia DaCosta mysteriously suggested Yahya Abdul-Mateen II’s incarnation of Candyman is a separate entity from Tony Todd’s. A new set pic of a catering truck labeled “Kraven’s” has been posted to Reddit. Head over there to see for yourself. James Wan shared a new photo of Annabelle as she appears in Annabelle Comes Home on Instagram. Spidey tours Europe on three new posters. Superhuman Idris Elba brandishes a flamethrower in a new photo from producer Hiram Garcia. Garcia also has a new photo of Karen Gillan with Dwayne Johnson from the upcoming Jumanji sequel. Mike Mignola, David Harbour, Sasha Lane, Milla Jovovich, Ian McShane, and Daniel Dae Kim hype the reboot’s loyalty to the comics in a new featurette. Dr. Sivana hams it up in the latest TV spot for Shazam. Variety has learned Craig Shapiro and Elizabeth Kruger will replace Carter Covington as series’ showrunner in season two. Bob Morley confirmed Bellamy will spend much of season six reestablishing trust with Clark in a new interview with TV Guide. I think it takes some time to even be able to address the situation between the two of them and I think they both have a lot of their own healing they have to do before they can even start to speak to each other on terms where it’s amicable or the ability for it to grow into a more healthy relationship [exists]. ... I think that Blake sibling relationship is a real barometer of how Bellamy’s feeling in any given season or where he’s going. I don’t think it’s something that they can walk away from that easily. That old adage of blood is thicker than water definitely rings true for them, but it’s just — there’s got to be a lot of water under the bridge before they can kind of develop into something more. But it’s not something that the two of them would happily walk away from, so there’s a lot of work to be done. KSiteTV also had a long chat with the actor about much the same. Bloody-Disgusting has three new images from season three. A storm approaches in a sneak peek at next week’s season finale of The Walking Dead. Finally, Black Siren is wanted for murder in the trailer for “Lost Canary,” airing April 15 in a new time slot.